The Nationals are in town for the Phillies' home opener today at Citizens Bank Park. Home openers haven't been kind to the Phillies in the past, having won just three since Citizens Bank Park opened in 2014. 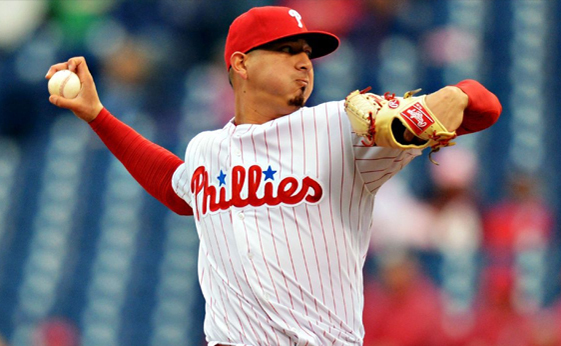 Vince Velasquez will be on the bump for the Phillies, coming off a decent 2016 campaign where he finished 8-6 with a 4.12 ERA. He also pitched extremely well at home last year, pitching to a 4-3 mark with a 2.88 ERA over 12 starts. Opposing Velasquez is Cy Young Award winner Max Scherzer. For his career, the lefty is 7-1 with a 2.14 ERA in 11 starts against the Phillies. Temperatures will struggle to get out of the 40's, plus the wind is blowing to right with gusts up to 20 mph. It's raw and blustery. The Nationals come into town having won two of three at home against the Marlins to open the season. Power has been an early calling card as the team has already hit six homers. Oddsmakers have the Nationals as strong favorites (-172) with the over/under set at 7.5. Clay Buchholz made his Phillies debut and lasted five innings, surrendering four runs on seven hits. Daniel Nava hit a pair of homers for the Phillies in the losing effort. Reds' reliever Michael Lorenzen broke a sixth-inning tie with a pinch-hit homer, marking the first time since 2009 that a pitcher hit a pinch-hit homerun. Adam Duvall pushed the Reds lead further with a two-run blast in the seventh.